Nowhere is that more apparent than in two counties that sit cheek by jowl, both in metropolitan Kansas City: Johnson and Wyandotte counties. State-by-state county health rankings released Wednesday by the Robert Wood Johnson Foundation and the University of Wisconsin Population Health Institute rate Wyandotte County 94th in health outcomes out of 101 counties in the state (four counties weren’t ranked). Johnson County weighed in at No. 2, behind Riley County. And Wyandotte fared even worse in the rankings’ “health factors” – behaviors such as diet and exercise, tobacco use, sexual activity, and alcohol and drug use, as well as access to and quality of health care, social and economic factors, and the physical environment. The county finished dead last among the 101 ranked counties. Johnson County was ranked No. 1. The two counties’ relative rankings have remained essentially unchanged over the years: Johnson at or near the top, Wyandotte – along with the state’s southeastern counties – at or near the bottom. How to account for the health chasm dividing counties that adjoin one another? Wyandotte, on the other hand, is the eighth poorest of Kansas’ 105 counties. Its median household income of $38,503 is about half that of Johnson County. Those wealth disparities go a long way toward explaining the counties’ health disparities. An immense body of research shows that social determinants – including economic factors – have a much greater impact on health than medical interventions. There are any number of reasons why greater wealth correlates with better health. Wealthier people might be better educated and thus better informed about health. It’s possible socioeconomic status is itself a cause of health. And wealthier people tend to have better access to health care. The bottom line: Richer people have higher life expectancies and lower morbidity than poorer people. Wyandotte County “has a sizable vulnerable population,” says William P. Moore, vice president of program and evaluation at The REACH Healthcare Foundation, which works to improve health access and quality on both sides of the state line. By that he means that, compared with Johnson County, Wyandotte County has more people living in poverty, more who don’t speak English or speak it very well, more homeless youth (it’s eight times as high in WyCo as in JoCo), more disabled people who have greater difficulty accessing care and fewer residents who have completed high school. The poverty figures are especially striking. Fully a quarter of Wyandotte County’s population lives in poverty, compared with only 6.5 percent in Johnson County. “Poverty and educational outcomes are very much associated with poor health,” says Wesley McKain, supervisor of Healthy Communities Wyandotte, an initiative launched in response to the first county health rankings in 2009, which listed Wyandotte County as having the worst health in the state. Communities Creating Opportunity, a faith-based group in Kansas City, has been working to identify medical “hot spots” in the greater Kansas City area – the ZIP codes with the highest concentrations of chronically ill and medically underserved residents based on emergency room use. And not surprisingly, preliminary results on the Kansas side show that the hottest spots coincide with some of Wyandotte County’s most economically distressed areas. “What are the factors that lead individuals to frequently utilize the emergency room?” asks Seft Hunter, chief operating officer of Communities Creating Opportunity. In nearly every category, the discrepancies are striking. In fact, one of the few categories in which Wyandotte County outperforms Johnson County is Alzheimer’s disease/dementia. And the reason for that should be fairly obvious: Wyandotte County residents have shorter life spans than Johnson County residents. And the biggest known risk factor for Alzheimer’s and dementia is increasing age. “It’s hard for people to be healthy if they don’t have the education and resources and the wherewithal to take care of themselves and follow directions and do the kinds of things that we all know are healthy for ourselves,” St. Peter, of the Kansas Health Institute, says. Of course, even drilling down to the county level is somewhat misleading, since the county averages are just that – averages – and don’t account for the different population subgroups within each county. That said, the overall health gap between Johnson and Wyandotte counties remains large – although initiatives such as Health Communities Wyandotte and the Healthy Campus project promoted by Mark Holland, mayor and CEO of the Unified Government of Wyandotte County and Kansas City, Kan., are helping to narrow the gap, however incrementally. “I think that it’s those sorts of long-term policy, social kinds of conversations and discussions we hope come out of the county health rankings,” he says. Editor’s note: Heartland Health Monitor partner KHI News Service is affiliated with but editorially independent of the Kansas Health Institute. This look at the two sides of the Wyandotte County/Johnson County line is part of KCUR's months-long examination of how geographic borders affect our daily lives in Kansas City. KCUR will go Beyond Our Borders and spark a community conversation through social outreach and innovative journalism. 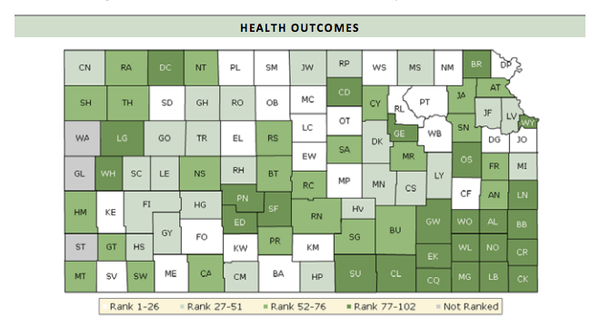 New health rankings show Kansas stuck at No. 27 among the 50 states, the same slot it occupied last year. But there was a time – not that long ago – when the state ranked much higher than the middle of the pack. The annual United Health Foundation rankings are a snapshot of 30 health measures ranging from clinical care to behavior and environment to state policy. Dr. Rhonda Randall, the foundation’s chief health advisor, says there’s no mistaking the trend.